A Minnesota mushroom hunter on the prowl for some fungi stumbled across an unbelievable find: two deer fawns sharing one body. The conjoined twin fawns, which were stillborn, are believed to be the first ones found to have reached full term and then be delivered by their mother. The only other examples of conjoined twin fawns have been found still in utero, said Gino D'Angelo, the University of Georgia researcher who studied the deer. "It's amazing and extremely rare," D'Angelo said. "We can't even estimate the rarity of this. Of the tens of millions of fawns born annually in the U.S., there are probably abnormalities happening in the wild we don't even know about." D'Angelo, an assistant professor of deer ecology and management at UGA's Warnell School of Forestry and Natural Resources, said a full examination of the conjoined twin fawns was a unique opportunity for researchers to study such a rare wildlife deformity. The results of his examination were recently published in the science journal American Midland Naturalist. The mushroom hunter found the fawns in May 2016 near Freeburg, Minnesota, on the forest floor about a mile from the Mississippi River. The fawns were clean, dry and appeared to be recently deceased. The hunter called the Minnesota Department of Natural Resources, where D'Angelo was working at the time. The fawns were frozen until a necropsy could be performed, so the specimen was kept in excellent condition, D'Angelo said. Researchers not only conducted a full necropsy, but also did a 3-D computed tomography—or CT scan—and a magnetic resonance imaging at the University of Minnesota's Veterinary Diagnostic Laboratory. They found that the fawns—which were does—had two separate necks and heads, but they shared a body. They had normal fur, normal heads and legs, and even "almost perfect" spot patterns running up their necks, D'Angelo said. Lab tests of the lungs confirmed the fawns never breathed air and were delivered stillborn, and the necropsy found that the does had a malformed, shared liver, extra spleens and gastrointestinal tracts, as well as two hearts that shared a single pericardial sac. "Their anatomy indicates the fawns would never have been viable," D'Angelo said "Yet, they were found groomed and in a natural position, suggesting that the doe tried to care for them after delivery. The maternal instinct is very strong." 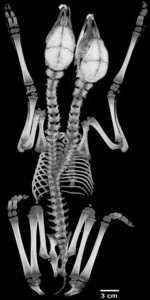 Conjoined twins are not unheard of in animals or humans, D'Angelo said, although most do not survive after birth. They are more commonly found in domestic animals—particularly in cattle and sheep—but far less common in wildlife. The researchers examined much of the scientific literature and found only 19 confirmed instances of conjoined twins in wildlife between 1671 and 2006, only five of which were in the deer family. 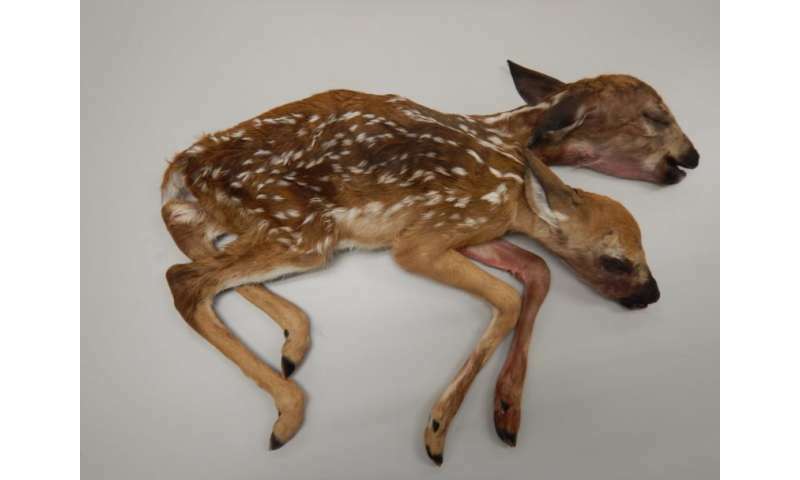 Only two cases of conjoined twins have been found in white-tailed deer, but both were fetuses who had not yet been delivered. Healthy twin fawns are the rule rather than the exception, D'Angelo said, because most adult does give birth to twins. Why these twins became conjoined is a mystery. "Even in humans we don't know," he said. "We think it's an unnatural splitting of cells during early embryo development." The conjoined fawns will be on display at the Minnesota Department of Natural Resource's headquarters in St. Paul, Minnesota, while a skeletal display will be housed at the University of Minnesota Veterinary Anatomy Museum.